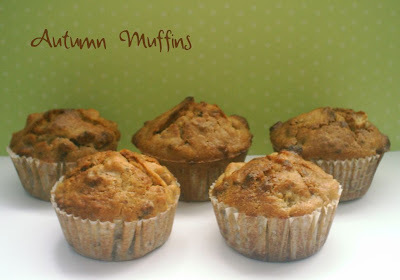 I’ve decided to call this recipe Autumn Muffins for two reasons. First, the combination of pears, nuts, and spices makes them very fragrant and indeed perfect for autumn (especially if you I serve them warm with a drizzle of maple syrup on a cold day). Second, I couldn’t really use the original name of Pear and Pecan Muffins as I didn’t add any Pecans to them. Pecans are usually expensive and hard to find here and since I’ve had lots of walnuts at home, I thought they would make a nice substitute. And, honestly, I don’t like Pecans much anyway. The original recipe for these tasty muffins comes from a book titled Muffins, which is one of the cookbooks from Le cordon Bleu series published by Könemann. I have already tried several recipes from it, and they all turned out great, so I really recommend it. 1. I used freshly grated nutmeg instead of powdered one - it made the muffins even more fragrant and thus more delicious!!! 2. I didn’t have vanilla extract (I think it’s impossible to obtain in Poland), so I added a packet of vanilla sugar to the dry ingredients. And, one more thing, it’s important you roast the nuts before adding them to the batter. They'll become very very crunchy and will contrast well to the soft, delicate, and moist pears later. Sift together flour, baking powder, salt, cinnamon, and nutmeg; Add brown sugar, vanilla sugar (if you use vanilla extract add it later to the liquid ingredients), pears and nuts. Fill prepared muffin pan ¾ full. Bake 30 minutes, or until a wooden pick inserted in center comes out clean. Leave the muffins in cups for 5 minutes. Then let them cool on a wire rack.